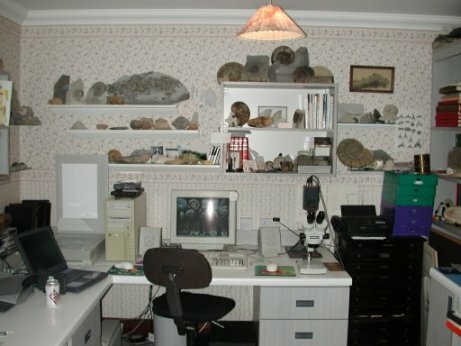 One or two visitors to this web-site have asked where/how the images are made, so I've created a virtual tour of my study. Be patient while the images download. 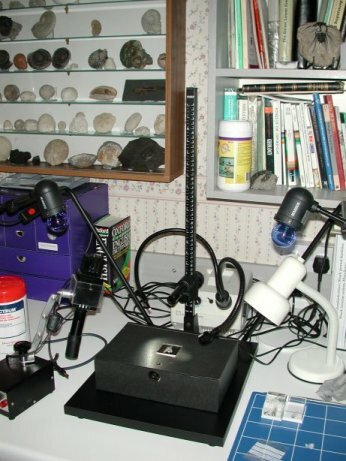 Personal computer setup, from left to right: laptop, scanner, pc and display, Meiji microscope with camera attached and connected to the computer. 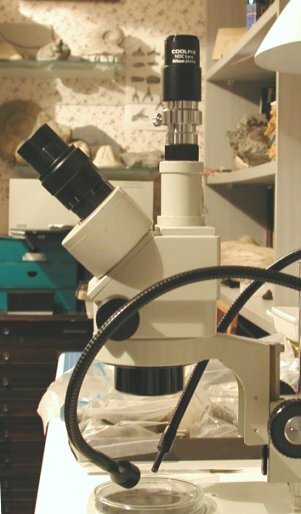 I can edit and manipulate images under the microscope directly on display. Use the Dr. Pepper can as the starting point of reference. 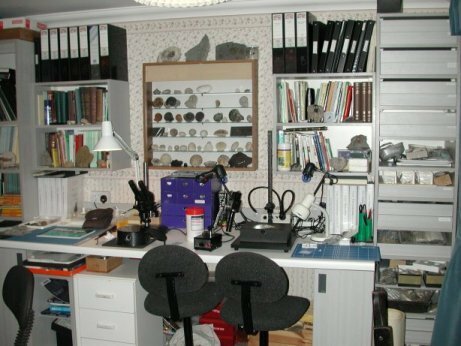 panning round the room to the right, bookcases & display cabinet and an old Russian microscope with amazing optics. moving across, Kaiser copy stand with "shadow-box" and Schott fibre-optic light source behind. You have to imagine a Nikon 990 CoolPix camera mounted to the stand (I'm taking these pictures with it). This is where my macro-photography takes place. Take a look at the bivalves section on the Gault web-site for examples of the imagry. 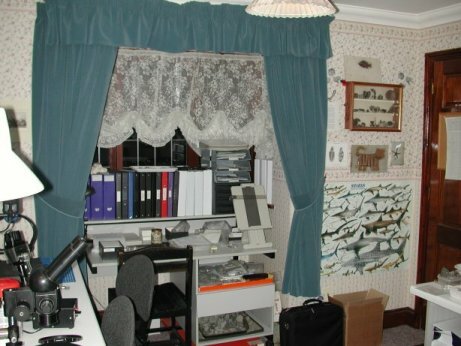 right again, another working area. Copy of new book on Sheppey Fossils in background. 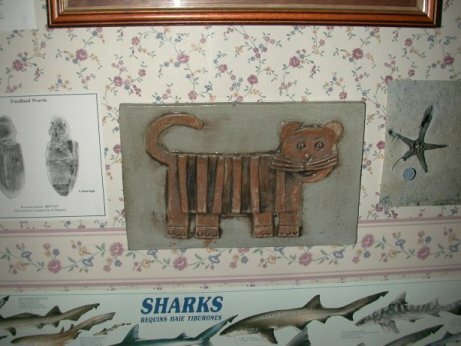 Then colour HP printer with a set of the "Treatise on Invertebrate Paleontology" in the bookcase behind; and back to the Dr. Pepper completing the circuit. 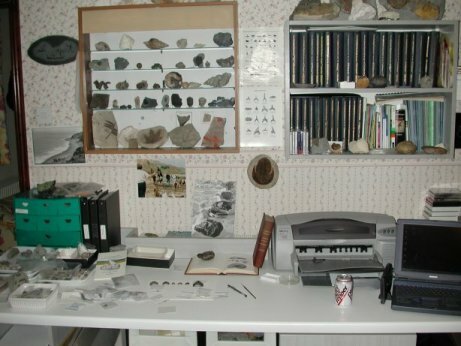 Close-up of HP Scanner - where most of the ammonite images have been made. Mammoth tooth on top of CD box. Images also made with the Nikon. Meiji EMZ-TR Trinocular microscope with relay lens and adapters for the Nikon CoolPix 990 Digital Camera used for creating images on the pages on the Gault Foraminiferida and Ostracoda and elsewhere on this web-site. 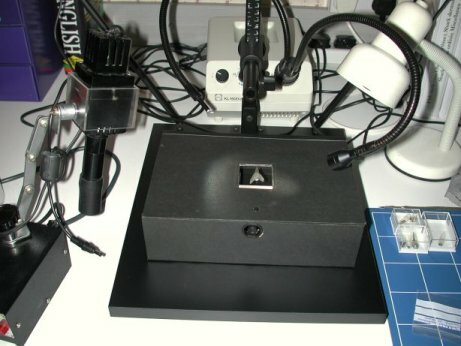 If you would like to know more about the connections between the microscope and camera go to adapters. 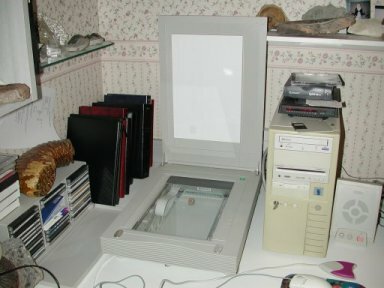 This is my "shadow-box" placed on a Kaiser Copy Stand and also used with the Nikon 990. The box is lined with matt black card, a square window cut out and glass inserted with a millimeter measuring scale on the bottom edge. Schott fibre-optics unit in background. Fossil placed on window and image made in macro-mode. Acknowledgement: Special thanks is due to David Ward of Orpington for introducing me to the Nikon camera and for help with ideas and techniques for making digital images, including use with the Meiji microscope and copy-stand.